Goodmorning! Today i woke up REALLY early and decided to get up (i know, scary) and start packing my bag for the holiday. Only two working days left, can i get a whoot whoot!? Here's what i was trying to pack. 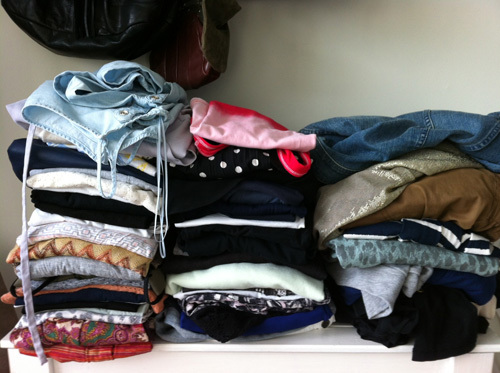 I told myself to start with pulling only the essentials, but seeing this huge pile of clothes i came to the conclusion the real essentials - like bikini's and suchs - are not even included yet. And shoes...! Mmh. Well i have to interrupt my holiday ponderings here and rush to work now. Have a good day! Hahaha, gaan jullie vliegen? Zoniet? lekker volgooien die auto :)!